The cerebellum plays a crucial role in the regulation of locomotion, but how movement is represented at the synaptic level is not known. Here, we use in vivo patch-clamp recordings to show that locomotion can be directly read out from mossy fiber synaptic input and spike output in single granule cells. The increase in granule cell spiking during locomotion is enhanced by glutamate spillover currents recruited during movement. Surprisingly, the entire step sequence can be predicted from input EPSCs and output spikes of a single granule cell, suggesting that a robust gait code is present already at the cerebellar input layer and transmitted via the granule cell pathway to downstream Purkinje cells. Thus, synaptic input delivers remarkably rich information to single neurons during locomotion. Our voluntary movements, such as shaking hands and walking, are controlled by a region of the brain called the cerebellum. Inside this region is a layer of cells called granule cells, which are the smallest and also the most numerous type of neuron in the brains of mammals. Granule cells receive information from many other parts of the brain and respond by producing electrical signals that influence the motor system, which tells our muscles how to move. However, it is not clear how the granule cells interpret the information they receive and ensure that the right muscles are stimulated at the right time by the motor system. Powell et al. have now used ‘patch-clamp electrodes’ to measure the electrical activity of individual granule cells in the cerebellum of mice, both at rest and as they walked. This is a powerful approach as it enables the recording of both the information received by each granule cell (input) and the electrical signals produced by it in response (output). Each mouse was placed on a treadmill with its head held still and given the choice to either rest or walk. These experiments show that when the mouse is resting, the granule cells are mostly inactive, producing only very low levels of fast electrical signals called ‘spikes’. When the mouse starts walking, the input to the granule cells triggers a strong increase in spiking in the granule cells. Powell et al. used a computer model to understand how the granule cells represent movement. Remarkably, this model could be used to predict walking patterns of the mouse based on the activity of a single granule cell and its inputs. These findings suggest that even single neurons in the cerebellum contain rich information about the movement of the animal. The next challenge is to understand how this code interacts with the rest of the motor system to produce precisely coordinated movements. Furthermore, it will be important to determine whether a similar code is used in other parts of the brain that control movement. In order to ensure generation of precise and reliable movements, information about movement parameters must be represented in neural circuits of the mammalian brain with high fidelity. Firing patterns directly related to specific movement parameters have been reported in single-unit recordings across several brain areas involved in movement representation and generation (Armstrong, 1988; Beloozerova et al., 2003). Crucial to generating such accurate representations is delivery of synaptic input patterns containing rich information about the animal's movement. However, we currently lack information about the input patterns received during movement for any neuron in the mammalian brain, and thus the input–output transformations performed in these neurons during movement are only poorly understood. The cerebellum is thought to play a key role in precise limb coordination during voluntary movements (Flourens, 1824; Vercher and Gauthier, 1988; Muller and Dichgans, 1994; Bastian et al., 1996; Holmes, 1922). Purkinje cells, the output cells of the cerebellar cortex, exhibit firing linked to the phase of the step cycle during locomotion (Orlovsky, 1972; Armstrong and Edgley, 1984; Edgley and Lidierth, 1988). How this information is represented in and transmitted by upstream neurons in the circuit, in particular in cerebellar granule cells—which form the input layer of the cerebellar cortex—remains unknown. Here we have taken advantage of the electrical compactness of granule cells, and their small number of excitatory inputs—4 on average (Eccles et al., 1967; Palkovits et al., 1971; Jakab and Hamori, 1988)—which allows for individual synaptic inputs to be resolved in vivo (Chadderton et al., 2004; Jörntell and Ekerot, 2006; Rancz et al., 2007; Arenz et al., 2008; Chadderton et al., 2014). Moreover, since granule cell activity plays a key role in regulating locomotion, including the coordination of individual limbs (Vinueza Veloz et al., 2014) as well as in in motor learning (Galliano et al., 2013), they represent particularly attractive targets for an electrophysiological dissection of their input–output relationships during locomotion. By recording the activity of mossy fiber boutons, EPSCs in granule cells, and granule cell output while mice are moving on a treadmill, we can thus reconstruct single cell integration of synaptic inputs in awake animals during locomotion, and identify the cellular representation of movement parameters in a defined site in the circuit. In vivo whole-cell recordings were made from mossy fiber boutons and cerebellar granule cells in lobule V of the cerebellar vermis. All recordings were performed in awake mice head-fixed on a spherical treadmill (Figure 1A). Granule cells and mossy fiber boutons were identified on the basis of their distinctive electrophysiological signatures (Chadderton et al., 2004; Jörntell and Ekerot, 2006; Rancz et al., 2007; Arenz et al., 2008). To study the link between voluntary movement and granule cell input and output we extracted a motion index from captured video frames (Figure 1B, see ‘Materials and methods’) and aligned this to the simultaneously acquired electrophysiological data (example recordings Figure 1C–E). The motion index was used to categorize the electrophysiological data recorded during quiet wakefulness (defined as periods where the motion index remained below a threshold rate of change of 0.025 a.u. per frame, for at least 30 consecutive frames, see ‘Materials and methods’) and voluntary movement. Whole-cell recordings from granule cells and mossy fibers during locomotion. (A) Schematic of recording configuration. (B) Calculation of motion index. Top panel: a single frame from a video of a mouse walking on the treadmill. Bottom panel: pixel intensity variation between the frame shown in the above panel and the previous frame are highlighted in red. The pixel variation between each frame was quantified for each video to give a continuous signal relating to average motion of the mouse (motion index calculated as described in the ‘Materials and methods’ and normalized to the maximum value in the video). (C–E) Example whole-cell recordings (black) from a presynaptic mossy fiber terminal (C), a granule cell recorded in voltage-clamp mode (D) and a granule cell recorded in current clamp mode (E), together with the corresponding motion index (red). (F–H) Section of each example trace shown in C–E at a higher timescale show spontaneous input recorded during a quiet period (left panels, orange frames in (C–E) indicate the location within the trace) and typical bursts of activity during locomotion (right panels, blue frames in (C–E) indicate the location within the trace). Summary data comparing the average instantaneous frequencies of mossy fiber spikes (I, n = 4 in 4 mice), granule cell EPSCs (J, n = 9 in 6 mice) and granule cell spikes (K, n = 6, in 4 mice). Mean group averages are indicated with black open and closed circles, error bars indicate standard deviation. During quiet wakefulness, granule cells exhibited a resting membrane potential of −67.0 ± 8.9 mV and an input resistance of 420 ± 210 MΩ (n = 47, in 24 mice). Recordings from mossy fiber boutons (Rancz et al., 2007) demonstrated a spontaneous average firing frequency of 21 ± 20 Hz (n = 6, in 5 mice). The average frequency of spontaneous excitatory synaptic currents in granule cells was 60 ± 35 Hz (n = 32, in 16 mice). Despite this relatively high input frequency, granule cell output spiking frequency was low: the average firing rate was 0.12 ± 0.31 Hz (n = 27, in 13 mice), and 62% of granule cells showed no spiking during periods in which the mouse was sitting quietly. In some cases we were able to successfully maintain recordings of activity during periods of voluntary locomotion (ranging from 17 s to 65 s, mean duration: 33.2 ± 12.3 s). This allowed to us to compare activity within single cells during quiet periods and during locomotion. Locomotion was accompanied by an increase in mossy fiber input to the granule cells, observed as an increase in firing frequency in 3 out of 4 recorded mossy fibers, although overall this was not statistically significant across the four recordings (Figure 1F,I; average, quiet: 11.7 ± 11.6 Hz; locomotion: 46.4 ± 43.3 Hz, n = 4 in 4 mice, p = 0.14, paired t-test) and increased EPSC frequency in all recorded granule cells (Figure 1G,J; quiet: 77.5 ± 37.6 Hz; locomotion: 144.0 ± 53.5 Hz, n = 9 in 6 mice, p < 0.0001, paired t-test). The firing rate of the granule cells also increased dramatically during locomotion (Figure 1H,K, average; quiet: 0.09 ± 0.2 Hz; locomotion: 5.3 ± 5 Hz, n = 7 in 4 mice, p < 0.05, paired t-test). During locomotion, granule cell action potentials occurred in sparse high-frequency bursts with high instantaneous firing frequencies (Figure 1H right panel, average instantaneous frequency: 106 ± 65 Hz; 4 out of 7 cells fired in bursts, defined as groupings of 4 or more spikes with ISIs less than 50 ms). These bursts consisted of an average of 11.9 ± 2.1 spikes with ISI 10.7 ± 3 ms, occurred with an average inter-burst interval of 1.88 ± 0.99 s, and were associated with a high coefficient of variation of the inter-spike interval (CV = 2.2 ± 1.1). The CV of the inter-spike interval was significantly higher than the CV of the EPSC inter-event interval during movement (1.1 ± 0.3, n = 9, p = 0.039, unpaired t-test). We used the bootstrap method (Roy, 1993) to calculate 95% confidence intervals on the GC EPSC/MFT spike ratio, which were 3.5–17.7 at rest, and 1.7 to 8.4 during motion, consistent with the known 4:1 anatomical convergence (Eccles et al., 1967; Palkovits et al., 1971; Jakab and Hamori, 1988). The sustained high-frequency barrages of EPSCs during locomotion (Figure 1G, right panel) were associated with large, slow inward currents, comparable to the slow spillover currents that have been observed at this synapse in vitro (DiGregorio et al., 2002; Xu-Friedman and Regehr, 2003; Nielsen et al., 2004). NMDA receptor activation could in theory underlie such slow currents; however the NMDA current is negligible in cerebellar granule cells at our −70 mV holding potential, due to the voltage-dependent Mg2+ block of the NMDA receptor channel (Nieus et al., 2006; Figure 2). We confirmed that the NMDA current is negligible using a GC model (Diwakar et al., 2009), adapted to match the NMDA/AMPA ratio of 0.2 found in adult mice (Cathala et al., 2003). At −70 mV, NMDA contributes at most 0.4% of the total excitatory synaptic current in this model. Furthermore, it has previously been shown (Cathala et al., 2003) that in the age and species of mice from which our data is derived, the vast majority of the NMDA current is transmitted by extrasynaptic receptors. We therefore concluded that spillover transmission must be responsible for most of the slow current we measured. Glutamate spillover enhances transmission during locomotion. (A) Voltage clamp traces recorded at a holding potential of −70 mV from two granule cells. Red line indicates the spillover current obtained by subtracting the fitted single exponential decays of the phasic EPSCs. (B) Relationship between the EPSC frequency and the relative proportion of excitatory current carried by the phasic EPSC component (average for all recorded cells; n = 9 in 6 mice). (C) Average cross-correlation of instantaneous EPSC frequency with spillover current (n = 9, dotted lines indicate standard deviation). Dashed line indicates zero lag. (D) Average EPSC burst triggered spillover current for all cells (dotted line indicates standard deviation). (E, F) Graphs showing increasing EPSC frequency and spillover conductance occurring with motion in an example granule cell (E) and as an average for all cells (F, n = 9). (G) Overlaid voltage traces showing spike bursts (red traces indicate the average). High-frequency bursting appears to be associated with greater subthreshold depolarization (left panel). 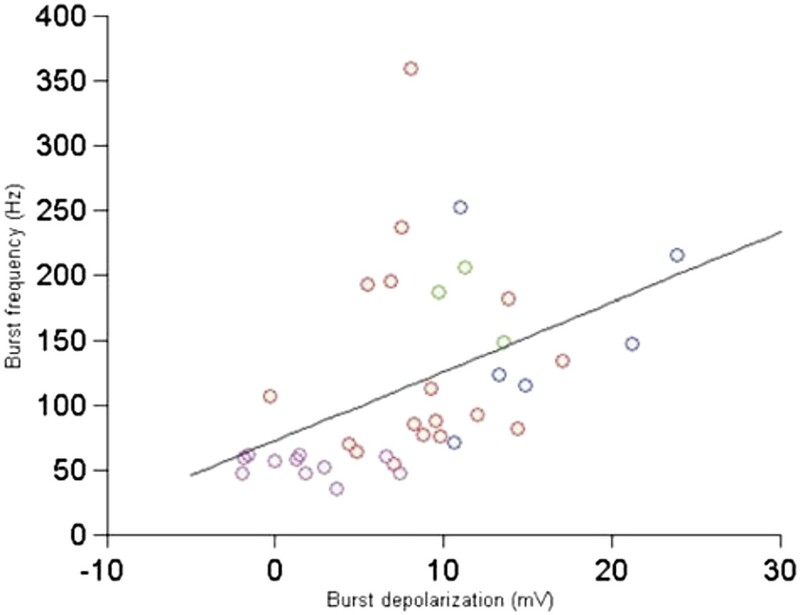 (H) Graph showing the relationship between spike burst frequency and subthreshold depolarization for individual bursts across all cells (n = 37 bursts from 4 cells, r = 0.45, p = 0.0055). 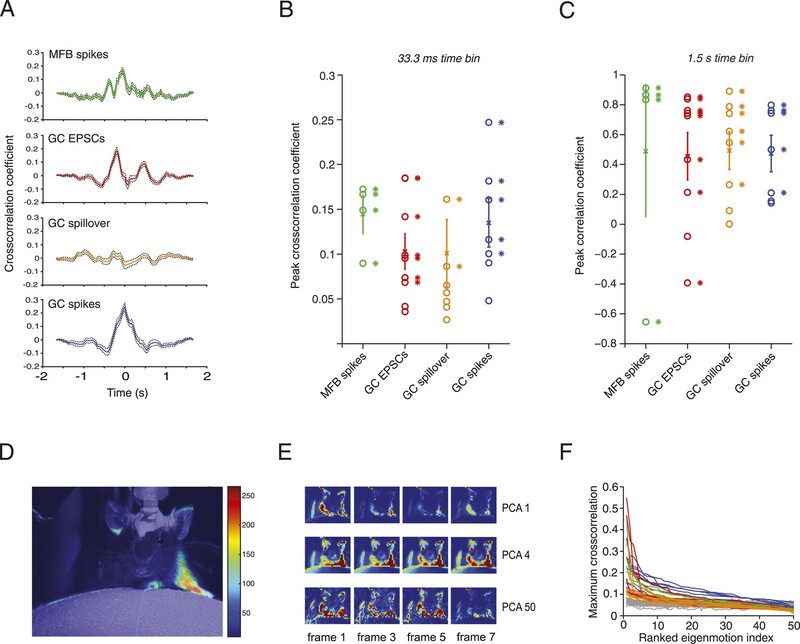 (I) A representative current trace showing the separation of phasic and spillover EPSCs. A granule cell model was then used to estimate the effect of spillover conductance on granule cell spike output. (J) Summary data showing the simulated granule cell spike frequency resulting from spillover, phasic and combined conductances, as well as combined conductances including an NMDA conductance (n = 9; see ‘Materials and methods’). To isolate the putative spillover components, we fit the fast EPSCs and separated them from the underlying slow current recorded at −70 mV (Figure 2A). The amplitude of the slow current was correlated with the EPSC frequency (Figure 2E shows this for an individual cell; Figure 2F for the population of n = 9 cells), such that the proportion of the total current carried by the fast EPSCs vs the slow current diminished with EPSC rate (Figure 2B), similar to what has been shown in vitro in response to trains of synaptic stimulation (Sargent et al., 2005). Since spillover results from synaptic accumulation of neurotransmitter, a delay would be expected between the peak of the EPSCs and that of the putative spillover current. Indeed, a cross-correlation between the instantaneous frequency of fast EPSCs and the slow currents showed a peak with a lag of 40 ms (Figure 2C), with the slow current lagging the fast events. Similarly, aligning the slow current on a burst of at least 5 EPSCs at 200 Hz or above exhibited a negative peak at positive delay (31 ms latency; 729 bursts from the 9 cells, Figure 2D). We further plotted the synaptic charge transfer over 100 ms as a function of EPSC rate with and without spillover (Figure 2—figure supplement 1). The spillover dramatically affects the slope of this curve. What is the functional role of the slow putative spillover current? In current clamp recordings from granule cells, we observed that spiking occurs in bursts (Figure 2G; 37 bursts recorded in 4 out of 7 cells), which were frequently accompanied by a slow depolarization (Figure 2G, left panel). As predicted, there was a significant correlation (r = 0.45, p = 5.5 × 10−3; Figure 2H) between the amplitude of the slow depolarization and the spike frequency in the burst. We hypothesized that the spillover could contribute to such spiking episodes. To study this, we used a spiking compartmental model of a granule cell (Diwakar et al., 2009), with an excitatory synaptic conductance based on the fast EPSCs and slow spillover currents recorded in voltage clamp. The depolarization generated by the slow spillover current was able to facilitate bursts that were not observed with fast EPSCs alone (Figure 2I). Consistent with this, the combination of spillover and fast currents produced significantly more spikes than either the spillover or fast current in isolation, indicating a synergistic non-linear interaction between the two currents (spiking rate for spillover alone: 2.69 ± 3.78 Hz, for fast EPSCs: 1.01 ± 0.94 Hz, for both: 9.27 ± 6.36 Hz, Figure 2J, p = 3.39 × 10−6; one way ANOVA). Next, we assessed the possible contribution of NMDA receptor currents to spiking under these conditions. We performed simulations using an NMDA to AMPA ratio of 0.2, which is physiological at this synapse (Cathala et al., 2003). Under these conditions a spiking rate of 9.74 ± 6.51 Hz is obtained, which is only slightly higher than without the NMDA channels (rate 9.37 ± 6.35 Hz, p = 2.70 × 10−8; paired t-test). We conclude that the slow putative spillover current contributes significantly to spike generation in awake, locomoting animals. We next wanted to study the relationship between activity in the granule cell layer and movement parameters. The mice were free to initiate locomotion at will, and were mostly quietly resting on the treadmill. We examined how EPSC activity changes at the start of these periods of locomotion, and found a sustained increase in rate from 100 ± 8 Hz to 145 ± 12 Hz (p = 0.0036, paired t-test, n = 23 periods from 9 cells comparing a 500 ms window 1 s before and immediately after locomotion onset; Figure 3—figure supplement 1). Similarly, at the termination of locomotion, there was a sustained decrease in EPSC rate from 139 ± 10 Hz to 106 ± 7 Hz (p = 0.0118, paired t-test, n = 23 periods from 9 cells comparing a 500 ms window immediately before and 1 s after locomotion onset). Note however that even in the absence of locomotion, EPSCs occurred at high frequencies. Next, we examined the precise relationship between activity in mossy fibers and granule cells during locomotion. Positive correlations were found between the motion index and MFB spiking, GC spiking, GC EPSC rate and spillover current in most cells at low temporal resolution (1.5 s; Figure 3C). At higher temporal resolution significant peaks in the normalized sliding cross-correlations were observed between motion and mossy fiber bouton spiking, granule cell EPSCs and granule cell spiking (Figure 3A,B). For spillover, only a minority of the cells (2 out of 9) showed a significant peak cross-correlation at high temporal resolution, consistent with it being a slow current. Together, these results indicate that overall motion during locomotion is represented in both granule cell excitatory input and spike output patterns. Relationship between motion and activity parameters of single granule cells. (A) Normalized cross-correlation between motion index and event frequency for a MFB (green), EPSCs (red), spillover (orange), and GC spikes (blue). (B, C) Peak normalized cross-correlation coefficients for each cell using fine time bins (33.3 ms; asterisks denote points with p < 0.05) and raw correlation coefficients using coarse time bins (1.5 s; asterisks in C denote correlation coefficients significant at the p = 0.05 level). (D) Spike triggered average of motion map overlaid on video of mouse. (E, F) PCA analysis: each video was decomposed into 50 8-frame principal components (PCs, top row, 4 frames shown for PC 1, 4 and 50). The activity of each cell was then cross-correlated over time with the PC coefficient (F). Each line represents the maximum cross-correlation of a single cell with the different PCs for the corresponding video (green = MFBs, red = GC-EPSC, orange = GC-spillover, blue = GC-spikes). The gray traces represent the average cross-correlation with bootstrapped data and therefore indicate the noise level. Note that the PCs were ranked according to their cross-correlation. To correlate specific movements with granule cell input and output, we performed activity-triggered averaging of motion maps in video images of locomoting mice (Figure 3D). Anatomically coherent regions of the mouse showed strong signals (19 out of 20 of these maps showed significant signals in the regions corresponding to one or more of the limbs, 9 out of 20 for the head, and 11 out of 20 for the body of the mouse), suggesting that more specific features of the motion could be read out by granule cell activity. We therefore decomposed the videos into principal components (PCs), which corresponded to motions of the mice, most often showing limb motion and/or locomotion at different speeds (Figure 3E). For all the 20 cells recorded, we used a semi-automated labelling algorithm (see ‘Materials and methods’) to classify the 50 highest eigenvalues and found that 738 out of 1000 showed periodic limb motion, 434 showed periodic head motion, and 370 showed periodic motion of the rest of the body. We performed a sliding cross-correlation of the electrophysiological activity with the projection of the video onto the 50 PCs with the largest eigenvalues. For all recording modalities, peak cross-correlation higher than 0.3 and up to 0.55 could be found (Figure 3F); these correlations dropped below 0.2 after the 10th component. Note that the correlations were higher than with surrogate data (grey traces, Figure 3F), which indicates that the neural activity correlated with specific PCA components more than would be expected by chance. Next, we examined the relationship of activity parameters to the step cycle of the mouse, focusing on the two forelimbs. Animals initiated periods of locomotion spontaneously, and would often be still for several seconds between these periods. Electrophysiologically recorded parameters in mossy fiber boutons and granule cells were strikingly modulated by the step cycle (Figure 4A–C), in either or both of the forelimbs. Specifically, statistically significant step cycle modulations were observed for mossy fiber bouton spiking (3 out of 4 cells for the right limb, 1 out of 4 cells for the left limb), granule cell EPSCs (5 out of 9 for the right limb, 4 out of 9 cells for the left limb), and granule cell spiking (0 out of 7 for the right limb, 2 out of 7 cells for the left limb); while spillover was not significantly correlated with step cycle. In Figure 4—figure supplement 1, we show why it is possible that despite high cross-correlations between spillover and EPSCs, significant step cycle modulations are not seen: a temporally filtered EPSC trace (using a biexponential kernel with rise time = 50 ms and decay = 100 ms) exhibits a cross-correlation with the original trace which is similar to spillover (Figure 4—figure supplement 1B), however its step cycle modulations are significantly lower (from 0.30 ± 0.03 to 0.13 ± 0.2, p = 4.65 × 10−4, paired t-test; n = 18—that is, 2 limbs for n = 9 cells), due to the low-pass properties of the filter. Decoding activity in a single granule cell can predict the step cycle. (A) Example step-triggered averages of activity for three different cells (EPSC and spillover examples are from the same granule cell). Gray-shaded area indicates the swing phase of the step cycle. (B, C) Step cycle modulation index for each forelimb across all cells. (D) Two state Hidden Markov Model (HMM) used to reconstruct the step cycle from electrophysiological recordings. (E) Example of successful step reconstructions for an MFB (red), GC EPSC recording (green) and GC spikes (blue). The top traces represent the electrophysiological event rate in Hz, the middle traces the step transition (with the high state being the swing phase and the low state being the stance) predicted by the HMM, and the lower trace being the actual step of the best modulated limb. (F) Prediction quality for all cells. To examine in greater detail the tuning of events to the step cycle, we plotted the step cycle modulation of the event rates on a polar plot for both forelimbs. Mapping the start of the step cycle to 0° of the circle, we observed that cells could show maximal modulation in a wide range of phases (Figure 4—figure supplement 2; range from 0 to 351°). The phase difference between the maximal modulation for one forelimb vs the other was clustered around 90°: 102 ± 30° for MFTs, 104 ± 19.2 for EPSCs, 74 ± 15 for GC spikes. Not surprisingly, the magnitude of modulation was highly correlated between the two forelimbs (n = 20 cells, R = 0.9, p = 3.48 × 10−8). However as the MFT example in Figure 4A makes clear, not all modulations of activity were in the same direction for both forelimbs. In the right panel of Figure 4—figure supplement 2C, we have plotted the maximum modulations as z-scores for one limb vs the other, which shows across the population that modulations can happen in all four directions (up-up, up-down, down-up, down-down). If these step-related modulations are sufficiently robust to provide a code for downstream Purkinje cells, it should be possible to reconstruct the step sequence from the recorded activity. We therefore implemented a two-state Hidden Markov Model (HMM; Rabiner, 1989), with one state representing the stance and the other state representing the swing phase of the step cycle (Figure 4D), and trained this model on the electrophysiological data. Note that the algorithm used to constrain the model is unsupervised in the sense that the learning procedure is never shown the actual step sequence. A predicted step sequence was generated for each trace by producing the most likely state sequence for the HMM trained on the trace. This prediction was then compared to the actual step sequence. For mossy fiber spikes, granule cell spikes, and granule cell EPSCs we found that in some cells (2 out of 4, 2 out of 5 and 2 out of 9 cells respectively, Figure 4E) accurate step sequence reconstructions (i.e., with p-values < 0.05) could be obtained (Figure 4F). In contrast, step sequences could not be reconstructed from spillover currents alone, indicating that while these currents are permissive for spiking during movement, they do not represent the details of individual movements. 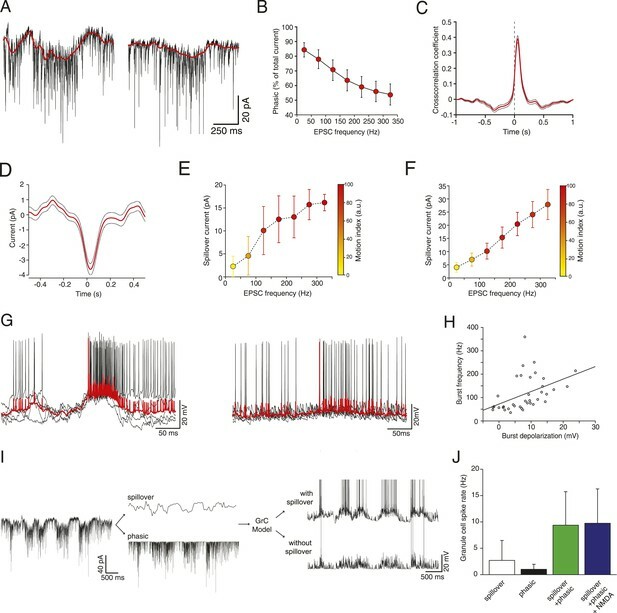 Together, these findings indicate that rich information about locomotion parameters is available to single granule cells in the cerebellar cortex, even at the level of synaptic input. We have directly measured synaptic input patterns and spike output in single neurons in awake mice, both at rest and during locomotion. Our experiments reveal that granule cells exhibit low firing rates in awake animals at rest, but high-frequency spiking during locomotion. Mossy fiber boutons can also exhibit dramatic increases in spiking driven by locomotion, which drives high-frequency bursts of EPSCs in granule cells, associated with a large glutamate spillover component that enhances spike output during locomotion. Surprisingly, locomotion can be highly correlated with the activity of single mossy fibers, EPSCs in single granule cells, and output from single granule cells. We demonstrate that a HMM allows the step sequence to be reconstructed from the activity of only a single mossy fiber; or EPSC input; or the spike output of a single granule cell. These findings provide crucial new insights into the synaptic representation of movement parameters, and how the cerebellar cortex processes movement. Our experiments represent the first whole-cell recordings from granule cells in awake mice. Information about granule cell activity patterns in awake animals has been extremely difficult to obtain. Extracellular recordings from the granule cell layer have suffered from the fact that the exceptionally dense packing of the granule cells has made it difficult to unambiguously assign spikes as arising from single granule cells (Hartmann and Bower, 2001; Gao et al., 2012). Although two-photon imaging approaches should in principle help to resolve this issue, the scattering nature of the densely packed granule cell layer, and the lack of reliable single-spike sensitivity of current genetically encoded calcium sensors combined with the difficulty of separating synaptic and action potential-linked calcium signals in granule cells has made it difficult to reliably estimate granule cell firing rates using two-photon imaging (Ozden et al., 2012). Our patch-clamp recordings allowed us to unambiguously record from single granule cells, and demonstrate that granule cells in awake mice exhibit remarkably low firing rates when the animal is at rest, similar to those observed in mormyrid fish under paralysis using similar techniques (Sawtell, 2010). Moreover, the electrical compactness of the granule cells allows us to make voltage clamp recordings to probe synaptic currents driving spiking activity. We demonstrate that the low spontaneous firing rates observed at rest in granule cells, which are surprisingly similar to those in anaesthetized (Chadderton et al., 2004; Duguid et al., 2012) and decerebrate (Jörntell and Ekerot, 2006) preparations, persist despite far higher spontaneous EPSC rates than are present under anaesthesia. This indicates that the low firing rate of granule cells is a general property of granule cells and suggests that it is under tight control by intrinsic mechanisms and by synaptic inhibition (Duguid et al., 2012), especially in the awake animal. Despite the low firing rates observed at rest, granule cells exhibited a dramatic increase in firing at the onset of locomotion, paralleling observations using two-photon calcium imaging in the granule cell layer (Ozden et al., 2012). This increase in granule cell firing rate was widespread across the granule cell population, indicating that granule cells switch from a sparse to a dense mode of activation during locomotion. The high firing rates of granule cells during locomotion was organized in bursts, reminiscent of the high-frequency bursts observed in granule cells with some forms of sensory stimulation (van Beugen et al., 2013), which in turn can be transmitted reliably to the Purkinje cell (Valera et al., 2012). Our voltage clamp experiments reveal that the locomotion-evoked spiking is driven by a significant increase in excitatory synaptic input to the granule cells, which is paralleled by an increase in spiking in mossy fibers, as shown by direct recordings from mossy fiber boutons. Some of the increase in mossy fiber input may be provided by activity in spinocerebellar pathways, which exhibit locomotion-related activity (Arshavsky et al., 1972a, 1972b; Orsal et al., 1988). These results indicate that the sensorimotor computations in neuronal circuits upstream from the mossy fiber pathways provide sufficiently strong activation to overcome the high threshold for output spiking in the granule cells. Future experiments are required to examine how the interaction between mossy fiber input and Golgi cell inhibition (D'Angelo and De Zeeuw, 2009) jointly determine the enhanced spiking output of granule cells during locomotion. Our experiments provide the first investigation of glutamate spillover in the awake behaving animal, and demonstrate that this feature of mossy fiber-granule cell transmission (DiGregorio et al., 2002; Nielsen et al., 2004) plays a crucial role in driving movement-related output spikes from the granule cell layer. Previous investigation of glutamate spillover currents has been restricted to brain slices, both in hippocampus (Kullmann and Asztely, 1998) and cerebellum (DiGregorio et al., 2002; Nielsen et al., 2004), and it has been unclear whether the stimulus conditions and levels of glutamate uptake present in vitro are representative of the physiological pattern of in vivo activation. We demonstrate that spillover currents make a substantial contribution to the synaptic charge during locomotion-evoked mossy fiber input. Furthermore, using a realistic compartmental model of the granule cell, we show that these spillover currents are essential for driving the observed output firing rates of the granule cell associated with locomotion. The biophysical properties of spillover currents appear to be ideally suited to help ensure appropriate granule cell firing patterns under resting conditions and during locomotion. Specifically, spillover currents are synergistically enhanced by the activation of multiple neighbouring synapses (Carter and Regehr, 2000; Arnth-Jensen et al., 2002; DiGregorio et al., 2002), as is likely during the high-frequency barrage of mossy fiber inputs activated during locomotion. Thus, the requirement of the spillover current for high spiking rates provides another mechanism to both ensure sparse granule cell firing at rest, and enhance firing during locomotion, increasing the signal-to-noise ratio of granule cell transmission of locomotion information. We show that granule cells exhibit very low spike rates in awake resting mice, despite high excitatory synaptic drive. Since granule cells represent the most abundant neuronal type in the brain, and spikes are energetically expensive (Attwell and Laughlin, 2001; Carter and Bean, 2009), the metabolic cost of sustained firing in this population would be considerable (Howarth et al., 2012). Therefore the ability to maintain sparse firing in granule cells at rest could be an important mechanism for energy conservation in the mammalian brain. During locomotion, however, spike rates can increase dramatically. We demonstrate that movement during locomotion exhibits an unexpectedly strong representation in mossy fiber input received by granule cells, as well as in the spiking output of individual granule cells. Remarkably, in some neurons it is possible to reconstruct the entire step sequence during locomotion from both input patterns and spike output, indicating that gait information is present even at the level of single granule cells. This indicates that a rich amount of information about movement parameters is already represented by individual synapses at the input layer of the cerebellar cortex. Thus, selective sampling of granule cells exhibiting tuning to a given phase of the step cycle may underlie the step cycle modulation of simple spikes observed in Purkinje cells (Orlovsky, 1972; Armstrong and Edgley, 1984; Edgley and Lidierth, 1988). Our results suggest that the synaptic representation of locomotion, rather than being based on a sparse code (Marr, 1969; Attwell and Laughlin, 2001; Howarth et al., 2012), relies on a population of tuned neurons, which shift from sparse activity to a dense gait code during movement. All experiments were carried out in accordance with UK Home Office regulations. Adult C57BL/6J mice (P40–60) were anesthetized with isoflurane (3–5% for induction, 0.5–2% for surgery, in pure oxygen). Throughout general anaesthesia, rectal temperature was monitored and body temperature maintained constant using a homeothermic blanket (FHC). Mice were placed in a stereotaxic frame, which allowed horizontal positioning of the head and implanted with a lightweight L-shaped metal head plate and recording chamber. The recording chamber was positioned directly above lobule V of the cerebellum. This region of the cerebellum was the most accessible, requiring the least amount of muscle removal, which was an important consideration for these awake experiments. Mice were allowed to recover from head implant surgery for a minimum of 48 hr. At least 3 hr prior to performing electrophysiological recordings, mice were re-anaesthetized with isoflurane (as described above). A small (∼200–500 μm) craniotomy was created through the skull directly above lobule V of the cerebellar vermis roughly 0.5–1 mm lateral of the midline and the dura removed. Agar and a silicone elastomer (Kwik-Cast, World Precision Instruments Ltd, Sarasota, FL) were applied to the craniotomy to seal it. When the silicone was fully set the mouse was removed from the head-holder and placed in a warm cage to recover from anaesthesia for ∼2 hr. Following recovery from anaesthesia mice were head-fixed ∼1 hr prior to starting the recording session. Mice were placed on a 20 cm diameter polystyrene ball that was secured to an air-table directly below and slightly in front of the headstage. The ball was mounted through its center on a horizontal axle resting on bearings. Mice were placed on the ball such that they could rest comfortably on its center and walk voluntarily. With this configuration mice habituated readily to head restraint, usually sitting quietly after 30–60 min. In vivo whole-cell voltage-clamp and current-clamp recordings were obtained from cerebellar granule cells and mossy fiber boutons as previously described (Chadderton et al., 2004; Rancz et al., 2007; Duguid et al., 2012). 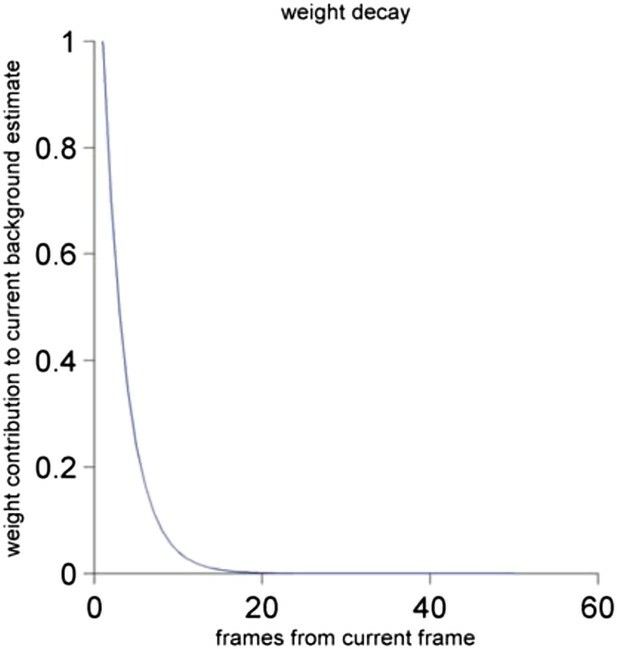 Recordings used for analysis lasted from 100 s to 950 s (mean average: 300 ± 186 s, n = 53, in 26 mice). Pipettes had resistances of 6–7 MΩ and were filled with an internal solution containing (in mM): K-Methanesulphonate, 133; KCl, 7; HEPES, 10; Mg-ATP, 2; Na2-ATP, 2; Na2-GTP, 0.5. EGTA, 0.1; pH 7.2. Granule cells were identified based on their characteristically small capacitance and depth from the pial surface (450–600 μm). Mossy fiber boutons were identified by their relatively high spontaneous spike rates, lack of synaptic input and characteristic spike waveform (Rancz et al., 2007). Electrophysiological measurements were amplified using a Multiclamp 700B amplifier (Axon Instruments, Molecular Devices, Sunnyvale, CA). Data was filtered at 4–10 kHz and acquired at 20 kHz using pCLAMP software in conjunction with a Digidata 1440A acquisition system (Axon Instruments, Molecular Devices). Electrophysiological data was inspected for artifacts relating to movement (large perturbations either side of the baseline). Recordings that demonstrated such artifacts were excluded from further analysis. Electrophysiological data were analyzed using custom-written macros in Igor Pro 6. Synaptic currents and potentials were detected using an amplitude threshold algorithm where the threshold for event detection was set at two times the standard deviation of the baseline noise (typically about 10 pA). Detected currents and potentials were verified manually through careful inspection of all electrophysiological data. where BGi is the background at time point i, and Framei is the video frame. Empirically, we found α = 0.3 to perform well with our dataset, this causes the background to be a weighted average over about the last 15 frames. Spike-triggered averages of this motion map were computed by binning the neural event rates in 33.3 ms bins (i.e., matching the frame rate) and weighting the frames by the event rate in the bin. A motion index was calculated by thresholding the motion map (with a threshold of 40 at 8 bit resolution) and summing the pixels exceeding the threshold. The motion index was used to define periods of quiet wakefulness and periods in which the mice were moving. Quiet periods were defined as periods in which the motion index changed by a rate of less than 0.025 arbitrary units per frame (with maximum rate of 1 given by the maximal pixel change) for at least 30 consecutive frames. Conversely, periods of movement were defined as rates of change greater than 0.025 a.u. per frame for at least 30 consecutive frames. These definitions were used to divide the corresponding electrophysiological data into periods recorded during quiet wakefulness and during locomotion for the analysis of spike and EPSC frequencies. We correlated the binned electrophysiological activity with the motion index at either coarse (1.5 s) or fine (33 ms) time scale. The electrophysiological activity was binned as follows: For EPSCs, GC Spikes and MFT spikes, we computed the average event rate in a bin. For spillover, we computed the average spillover current (as determined by our fitting procedure below) in a bin. For the coarse time scale correlation, we split the motion index and electrophysiological activity into 1.5 s bins and averaged the data in these bins, and then calculated Pearson's r coefficient between the event rates (for EPSCs, GC spikes, MFT spikes) or current (for spillover) and the motion index. For the fine scale correlation, we made the bin size the duration of a video frame (i.e., 33.3 ms) for ease of analysis. We performed a rolling normalized cross-correlation between the electrophysiological data and the motion index, by shifting a 3 s window across the data. For each window, the mean was subtracted from both the motion index and electrophysiological data, and a cross-correlation performed. For each cell, an average cross-correlogram was computed by averaging across shifts, and the peak in this cross-correlogram was measured. To establish whether these correlations were significant, we generated bootstrap samples for each cell by repeating the analysis with shuffled versions of the corresponding binned electrophysiological activity, which allowed us to generate a z-score for each cell. This z-score was used to look up a one sided p-value in a standard normal table. p-values were Bonferroni-corrected for multiple comparisons, and the significance level was set at p = 0.05.
where ß is a cubic spline function with control points, Ci is the ith control point of the spline, NEPSCs is the number of fast EPSCs in the data, ampi is the amplitude for the ith fast EPSC, ζ is the biexponential function with a rise time of τrise and a decay time τfall, Ti is the onset of the of the ith fast ESPC. The data was collected in continuous sweeps of 5 s, and we therefore fit the model separately to these 5 s episodes. The fitting procedure was as follows: a peak finding algorithm was used to detect the fast EPSCs in the raw voltage clamp traces. We initiated ß to be equal to zero, NEPSCs to be equal to the number of peaks found by the algorithm, ampi to the amplitudes found by the algorithms, Ti the time of the events, τrise was set to 1 ms and τfall was set to 10 ms. We then used the Matlab nlinfit function to fit the model to the raw traces, adjusting the spline parameters, the ampi and τrise and τfall. To correct for slow drifts in the holding current during a long recording, we set the maximum of the ß trace for each 5 s episode to be zero. The spline fits baseline shifts in the traces not accounted for by summation of fast events, and we used it as our measure of putative spillover. 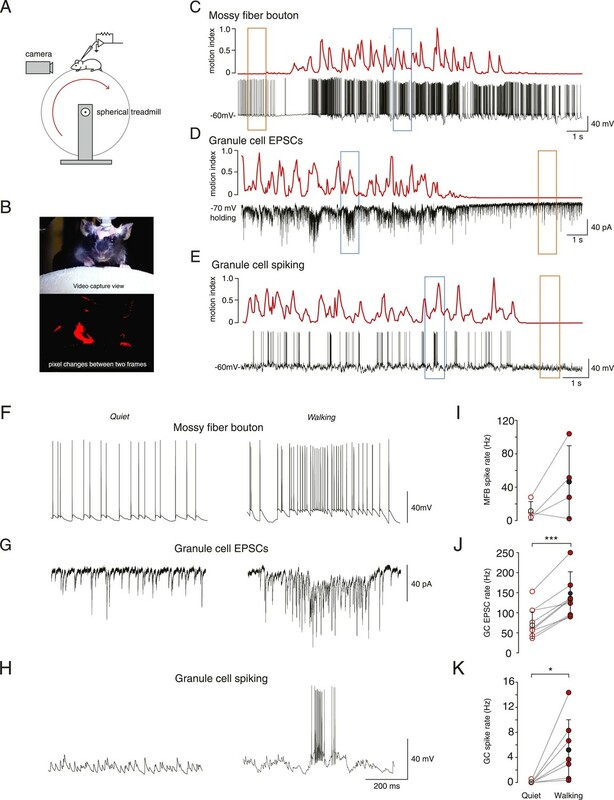 Note that since spillover currents are known to contribute to the tails of fast EPSCs (DiGregorio et al., 2002), we are underestimating the total contribution of spillover transmission in granule cells in the awake mouse. The relative contribution of phasic and spillover transmission as a function of EPSC rate was calculated as follows: the smoothed EPSC rate was computed by convolving a causal exponential kernel (with tau = 50 ms) with a train of delta functions placed at the times of the fast EPSCs as found by our fitting procedures. We then iterated over all events in all cells and calculated the ratio of the fast current at the peak of the event on the spillover current at that time, treating each event as a data point. These data points were then binned by EPSC rate. For Figure 2E,F we also related the currents to the motion index, convolved with a causal exponential kernel (with tau = 660 ms). To calculate the cross-correlation between EPSC rate and spillover (Figure 2C), we used the smoothed EPSC rate trace and the putative spillover traces from the fitting procedure, both mentioned above, and used a 2 s sliding window over the traces. For each window, we computed a normalized, mean subtracted cross-correlation between the EPSC rate and spillover traces. We then computed the mean cross-correlation, averaged across all cells and all the sliding windows. For the burst-triggered spillover, we defined a burst as a group of 5 or more EPSCs occurring at 200 Hz or more. We averaged the spillover trace triggered by the first event of such bursts (Figure 2D). We employed a published cerebellar granule cell model (Diwakar et al., 2009) to study synaptic integration using in vivo patterns of activity. This model consists of a detailed compartmental model of a spiking granule cell for the NEURON simulation environment. We only modified the model by adding a fixed tonic inhibitory conductance at the soma of 1 nS (Erev = −70 mV). The model was run in current clamp mode. To inject the patterns of excitatory input we recorded in vivo, we added an AMPA synaptic conductance (Erev = 0 mV) which was varied dynamically to correspond to the conductance underlying our voltage clamp traces, assuming a driving force of 70 mV. Our spillover analysis described above separated our voltage clamp recordings into the contributions from the fast EPSC current, and the slow putative spillover traces, so we could feed these separately or summated into the model and record the spike output of the model cell. We also performed simulations in which an NMDA receptor conductance was added to the spillover and phasic AMPA conductances, with an NMDA:AMPA ratio of 0.2 (Cathala et al., 2003), and a voltage-dependent Mg2+ block modelled according to (Nieus et al., 2006). For the current clamp GC recordings, burst analysis was done as follows: spikes were detected in the raw traces using a voltage threshold (−10 mV). A procedure then iterated through the spikes and grouped them into bursts if 3 or more spikes appeared in succession with an ISI less than 50 ms. The depolarization underlying a burst was quantified as the voltage averaged across a 5 ms interval starting 1 ms after the first spike in the burst, after subtracting a baseline voltage, defined as the average voltage over a 180 ms interval starting 20 ms before the first spike in the burst. The videos were downsampled spatially by a factor of 2, and PCs of the video were calculated by first computing the motion map of the video as above, and then shifting an 8 frame window across this motion map. For each of the videos, we created a data matrix where the rows contained the 8 frame windows of the motion maps. The standard pca function in Matlab was then used to obtain the PCs of this matrix, as well the coefficients of each video in this eigenbasis. We kept the 50 components with the highest eigenvalues for each video. For each of these components, we then computed a sliding cross-correlation between its coefficient in the video and a binned version of the electrophysiological trace (as described in the video analysis section). The sliding cross-correlation was computed as detailed above for the motion index. To establish the noise level, we generated bootstrap samples by repeating the analysis on shuffled versions of the binned electrophysiological traces. where PC[x, y, i] is the PC at pixel x, y and the i-th frame, and n is the total number of frames in the PC. A ROI, and therefore a body region, was deemed to be participating in the motion of the PC if Δ exceeded a threshold. Note that in these head-fixed recordings, ‘head’ movement refers primarily to movement of the whisker pad and ears. To select the threshold in a non-arbitrary manner, we also selected ROIs corresponding to background for each of the video. We then charted the distribution for the Δ's in these background ROIs. In all of the videos, Δ ranged from 0 to 2500, and therefore we selected 3000 as our threshold. To test for significance, we generated bootstrap samples by selecting for each step a random window from the corresponding binned electrophysiological trace. For the individual cells, we considered a modulation index to be significant if its associated z-score corresponded to a p-value < 0.05 after Bonferroni correction for the numbers of cells within that recording modality. When measured across the population, while the mean pooled z-scores were positive, they were not significant (mean z-scores were MFBs: 2.4427 ± 2.8788, p = 0.3995 for left limb, 5.2776 ± 4.2794 for right limb. EPSCs: 3.0553 ± 1.5468, p = 0.0695 for left limb, 2.3266 ± 1.0831, 0.0522 for right limb. GC-spikes: 0.0980 ± 1.0836, p = 0.9243 for left limb, 0.1723 ± 2.0968, p = 0.9312 for right limb. Spillover: −0.1011 ± 0.3651, p = 0.7764 for left limb, 0.0192 ± 0.4422, p = 0.9645 for right limb). This is not surprising, since it reflects the fact that that only a subset of the granule cells are well-modulated by the step cycle, which is to be expected given the variety of inputs to the granule cell layer. where activity is the step-triggered activity vector as in Figure 4A mapped on 360° (i.e., this works out to each degree in the plot corresponding to 5 ms). For ease of visualization, we subtracted from R the minimum value across phases and then divided by the maximum value, so R is between 0 and 1. We picked the phase of maximal modulation as the phase that maximized R. In Figure 4—figure supplement 2, we plotted the modulations as z scores by subtracting the mean of the step triggered activity vector for each recording and dividing by its standard deviation. A two state Markov model was constructed using the Bayes Net Toolbox (https://code.google.com/p/bnt/). The output distribution was modelled as a mixture of four Gaussians. The observed data at time i consisted of a 360 ms window of the electrophysiological data starting at time i. For the EPSCs, the activity in each window was normalized to the mean; for the spiking data, the baseline activity (average activity of the first 90 ms in the window) was subtracted. All the parameters were initiated at random, except for the prior probabilities of the states and initial state transition matrix that was derived for each cell from the step data annotated manually. The Bayes Net Toolbox was then used to perform a Baum-Welch algorithm to optimize the prior probabilities, the transmission matrix, and mixture of Gaussian parameters. The Viterbi algorithm was then used to reconstruct the predicted state transition through the HMM. To score the prediction against the real stepping data, we first converted both the prediction and real data into spike trains, by placing spikes at the transitions from stance to swing. We then used a commonly utilized metric between spike trains (Schreiber et al., 2003) to compute the quality of the step reconstruction. Briefly, this measure computes a normalized, mean-subtracted cross-correlation between spike trains convolved with a Gaussian kernel (we used a sigma of 100 ms), and then takes the peak of the cross-correlation as the measure of similarity between the trains. This value can vary between 0 (no similarity) and 1 (identical trains). We multiplied this value by 100 to get a percentage score. For each limb, we took the average of the percentage score over 10 runs of the HMM algorithm to get the average prediction score. For each cell, we selected the limb that was best predicted by the activity and reported its prediction score. To test for significance for each cell, we generated bootstrap samples for each cell by repeating the above procedure on shuffled version of the electrophysiological data for the cell, and generating a z-score of the prediction score. The prediction for each cell was deemed significant if its associated one-sided p-value was <0.05 after Bonferroni correction. The Journal of Physiology 405:1–37. The Journal of Physiology 352:403–424. The Journal of Physiology 401:399–415. Journal of Cerebral Blood Flow and Metabolism 32:1222–1232. Proceedings of the IEEE 77:258–286. Journal of Statistical Computation and Simulation 47:89–90. Frontiers in Neural Circuits 7:95. Thank you for sending your work entitled “Synaptic representation of locomotion in single cerebellar granule cells” for consideration at eLife. Your article has been favorably evaluated by Eve Marder (Senior editor), a Reviewing editor, and three reviewers. 4) Considering the physical referents of the model more carefully, regarding whether the granule cells are signaling sensory vs. motor information [Reviewer 3, point 1]. The reviewers have raised a number of additional points that will also require clarification. The full set of comments is attached below to facilitate your revisions. In this manuscript Powell et al. studied the synaptic inputs into cerebellar granule cells during locomotion. Using in vivo patch-clamp recordings, authors illustrated a correlation between locomotion and neural activities at the input stage of cerebellum, i.e. increasing mossy fiber and granule cell activities, and the increased spiking in granule cells is facilitated by glutamate spillover currents. Furthermore, Powell et al. found that the locomotion circle can be precisely predicted by the activities of some granule cells and suggested an alternative interpretation of information transfer from granule cells, which differs from the classical view of sparse coding. This study aims to illustrate an important question in the cerebellar research (how do the cerebellar neurons encode information during locomotion), using challenging techniques (whole cell recordings in awake locomoting mice). The results are interesting and presented well. I have several suggestions to further improve the manuscript. 1) It is somewhat surprising that most MF boutons and all granule cells increased their spiking firing during locomotion. As the mossy fiber inputs encode multiple modalities, and these modalities can converge onto the same granule cells, it remains unclear how come that all the recorded granule cells increased firing during locomotion. For instance, the increase of mossy fiber activity in Figure 1C shows a clear lag behind the onset of locomotion and a prolonged period after the termination of walking. This raises the question as to what extent the neural activities are influenced by the shift in brain state during locomotion? 2) In the last sentence of the subsection headed “Whole-cell recordings from granule cells and mossy fibers during locomotion”, what do the authors mean by ‘a more dense code’? I don't think a difference in CV value can be translated into the difference in coding density. Since the previous work from authors' lab suggested a high feudality, detonator-like information transfer onto granule cells, it is unclear to me how this difference in coding density came about. 3) What is the impact of synaptic inhibition on granule cells during locomotion? MF inputs can also influence the granule cell output via the inhibitory inputs from Golgi cells, which is thought to create a proper time window for granule cell spiking (D'Angelo and De Zeeuw, 2009). The IPSC pattern during locomotion should also be examined. 4) The importance of spill-over during locomotion is unconvincing due to the lack of proper experimental data. Indeed, the behavioural analysis showed that the spiking patterns are correlated to locomotion, rather than the occurrence of spill-over transmission per se. The computational model in Figure 2I, J can be simply explained by two sub-threshold inputs summating to create a supra-threshold output. Given a supra-threshold conductance, can spill-over or phasic input alone create supralinear spike output; this needs to be examined. 5) In the quiet state, mossy fiber boutons (MFB) were found to fire at around 12 Hz (as detailed in the subsection “Whole-cell recordings from granule cells and mossy fibers during locomotion”). Under those circumstances, granule cells showed EPSCs at approx. 78 Hz (almost 7x as often). When active, the MFB fired around 46 Hz, while granule cells had EPSCs at ∼114 Hz (almost 2.5x more often). Given that in each granule cell receives input from approx. 4 MFBs, independent of the behavioural state, one would expect a ratio of approx. 1:4 (as reported in the first paragraph of the above mentioned subsection). Please discuss this in more detail. 6) The report of spiking frequency of granule cells, especially during locomotion is a bit confusing. The authors report an average rate of 5 Hz, but burst of up to over 100 Hz (in the second paragraph of the subsection headed “Whole-cell recordings from granule cells and mossy fibers during locomotion”, Figure 1K). Burst firing is ill described by using the mean firing rate. 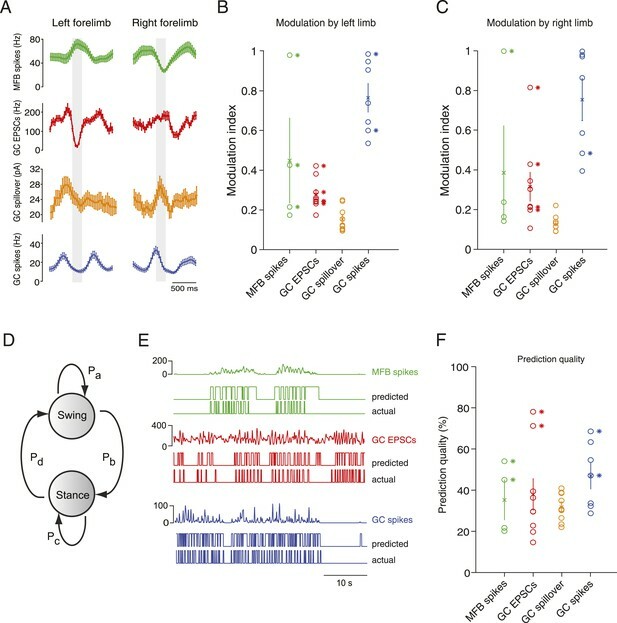 7) What do the authors mean with “anatomically coherent regions” (subsection “Linking synaptic input parameters with output spiking during locomotion”)? Please give more details here. 8) The authors argue, and this seems plausible, that the neuronal firing patterns correspond to different features of motion rather than to the degree/intensity/amplitude of each motion. Can the authors elaborate on this? Does this imply that granule cells do not encode the degree/intensity/amplitude of each motion parameter? Or do they do both? Please provide in detail how many cells, what percentage of the cells show what, etc. 9) Last sentence in the Discussion. I don't think authors' data provide sufficient argument against the sparse coding in cerebellum. As mentioned previously, it is unclear what the extremely high incidence of detecting responsive granule cells really means. If this probability reflexes the true population response, that must indicate that almost all granule cells in lobule 5 are encoding for similar information during locomotion. If so, what do the authors mean by ‘a population of robustly tuned neurons’? This is a potentially interesting study that provides new results on information processing at the input stage of the cerebellar cortex during behavior. A strong point of the paper is that the authors use a variety of experimental and modeling approaches to address the issue. My main problem is that many of the methods are results are not described in enough detail to fully judge the validity of the findings and the strength of the conclusions. Results section: the durations of the various recordings (MFs and granule cells) is not given. The averages and minimum acceptable recording durations should be given for the various conditions. The definitions of resting versus quite wakefulness need to be made clear. Otherwise the various firing rate values seem inconsistent. For example, at rest MF spikes and granule cell EPSCs occurred at 21 and 60 Hz. But during quiet rest the values were 11.7 and 77. 5 Hz (note the divergence between the spikes and EPSCs). So, how do the two conditions relate to each other and to the locomotion state? In the first paragraph of the subsection headed “Whole-cell recordings from granule cells and mossy fibers during locomotion”: It is stated that the MF frequency of 21 Hz and the EPSC frequency of 60 Hz are consistent with there being 4 MF inputs. However, it seems that the ratio is more consistent with a granule cell having only 3 MF inputs, which doesn't fit with the anatomy. How can you explain the discrepancy? In the subsection entitled “Whole-cell recordings from granule cells and mossy fibers during locomotion”: A motion index was used to categorize the state of the animal as being either in quiet wakefulness or voluntary locomotion. From the description of the motion index in the Methods, one can perhaps see that it indicates when the animal is making movements, but it is hard to see how it shows that the animal is specifically locomoting. Further the description of the BG calculation is vague. How long is ‘a long time’? The nature of the objects in the formulas is not entirely clear to me. BG, Frame and im seem to be matrices but diffim seems to be a single number based on the summation sign. Is BG the same size as the entire Frame? The calculation is not described consistently between the Methods and the legend for Figure 1: in the Methods the motion index is described as a summation, but in the legend it is described as a fraction. In the second paragraph of the subsection “Whole-cell recordings from granule cells and mossy fibers during locomotion”: It seems that only 4 MFs were recorded for the comparison between quiet rest and ‘locomotion’. This seems a very low number to base a conclusion on, particularly when 3 MFs increased activity, and 1 decreased. In the third paragraph of the subsection headed “Glutamate spillover currents drive spiking during locomotion”: The correlation r=.44 in the text doesn't match the r=.45 given in the legend for Figure 2H. Also, with an n=7, the p-value doesn't match what is given (at least for a t-test). Thus, I assume the n for the statistical test is actually the number of bursts shown in the Figure 2I (about 35-40). If this is the case, it suggests that very few bursts were examined in each cell (about 5). Is this correct? Given the distribution of the residuals about the regression line in Figure 2H one wonders if the relationship varied considerably between recordings. Is a relationship seen on an individual cell basis? How were EPSCs counted? From Figure 1 they appear to have many amplitudes, suggesting summation of synchronous events. However, in the Methods it appears that a simple single level (2xSD) was used. This could significantly under count EPSCs particularly for the high frequency conditions. In the second paragraph of the subsection headed “Linking synaptic input parameters with output spiking during locomotion”: It is not clear which of the principal components ended up in the top 50 or top 10. Did these correspond to limb, head, rest of body motions and/or combinations of these three motions. Even if manual inspection was used, some criteria must have been used and should be described. Were the decisions made blindly by several people to test for consistency across observers? In this manuscript, Powell et al. performed in vivo whole-cell patch-clamp recordings from cerebellar granule cells (GCs) and mossy fibre (MF) terminals in awake mice during locomotion. They investigated how synaptic inputs and spike outputs of GCs represented gait information. They first found that frequencies of both inputs and outputs of GCs increased during movements of mice and also showed that putative spillover currents had significant contribution to spike outputs during movements. The authors next showed that MF spikes, GC EPSCs, GC spillover and GC spikes well correlated with movements. Finally, they succeeded in reconstructing gait patterns from input and output patterns of single GCs. The data provided are in very high quality as we usually expect from this group and I congratulate them on the considerable technical achievements made in this study. There is no question that information during locomotion is conveyed by either synaptic inputs or spike outputs of GCs. The key question is whether movement parameters are indeed represented by the activities of GCs that they observed, which is the main claim here. Unfortunately, I am not fully convinced with the interpretation of the data and the significance of the findings. I have the following concerns that need to be addressed. 1) In Figure 4, the authors performed the decoding of input and output patterns of GCs using Hidden Markov Model, and successfully reconstructed gait patterns. However, it does not necessarily mean that these signals contain information of movements given that the two-state model they used may only represents sensory inputs (touched and untouched) rather than movements (stance and swing). Since they filmed the movements of forelimbs, they should try to track the trajectories of forelimb movements and then reconstruct them from GC activities. 2) In Figure 2, glutamate spillover currents significantly contributed to the spike outputs of GCs, and subthreshold depolarization strongly correlated with the frequency of burst firing of GCs during movements (Figure 2H). However in Figure 3 and 4, peak correlation between the motion index and the spillover was fairly low. The authors explain that this is due to slow time course of spillover currents (subsection “Linking synaptic input parameters with output spiking during locomotion”). However, the strong correlation between spillover currents and GC spike outputs indicates that the time course of change in CG spike rate is similar to that of spillover currents (Figure 2G, left). Therefore the correlation between spillover currents and the motion index is expected to be similar to that of GC spikes. 3) Analyses of the difference between the left and right limbs are interesting. In particular, the direction of modulation seems to be opposite in a single GC (Figure 4A). It is a pity that the authors only analyzed the absolute depth of modulation and discarded the information about alternation of the left and right limbs. They should analyze the relation between the left-right alternation and GC activities, which should also be related to the laterality of the recording site. The primary issue is whether the data support the conclusion that the granule cell activity is really correlated to “specific attributes” of the motion, as detailed in Reviewer 2's point #2 below. This issue could be most simply addressed by editing the text to curtail the extent of the conclusions. The authors have addressed virtually all issues. One relevant point left, regarding reviewer 1's major point 6: the authors improved their description of the spiking patterns observed, as they now explicitly refer to particularities of burst firing (in the third paragraph of the subsection headed “Whole-cell recordings from granule cells and mossy fibers during locomotion”). Unfortunately, in Figure 1, the authors still present a trace with an instantaneous firing rate of probably well above 100 Hz (Figure 1H) next to a summary stating a maximum frequency of around 15 Hz (Figure 1K). I think it would be better to address the burst firing also in the figure itself. All the rest is well done. The authors have clarified and addressed the points previously raised. There are some significant findings. 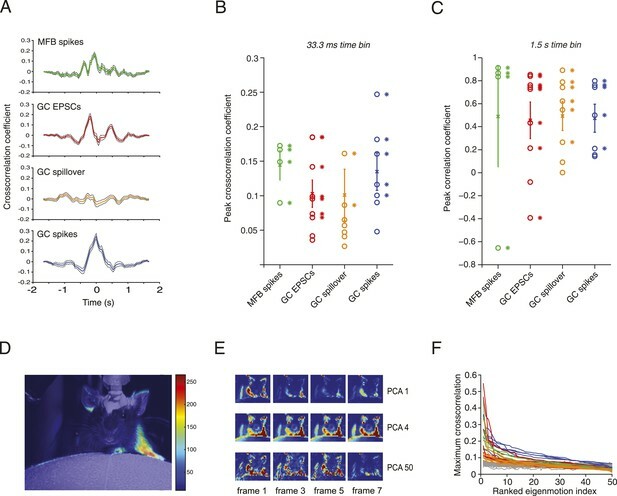 Most significant is the recording of granule cell activity in awake animals and the comparison of activity during restful waking and locomotion. The major remaining concern I have is with the interpretation of the results. I think given the low sample sizes for the locomotion recordings (particularly for the mossy fibers, but even for the granule cells) the authors need to be conservative in their conclusions. 1) In first lines of the Discussion and elsewhere the authors imply that they have “directly measured the transformation from synaptic input patterns to spike output in single neurons”. This statement suggests that they have measured the inputs and outputs to the same cell and that they have defined the transform for individual cells. They have not. What they have done is record two populations of cells and try to infer how activity transforms from one to the other. The problem is that each of these populations is heterogeneous in terms of spontaneous and behavior-related activity. Thus, any number of transforms is possible depending on how MFs connect with granule cells. Even the recordings of granule cell EPSCs and spikes were done for different (though perhaps overlapping) populations of cells, so we cannot say how the EPSCs relate to the specific firing patterns. 2) The authors state that their results show that the activity of individual granule cells is tuned to “specific features of the animal's motion, rather than merely correlating with just the amount of motion”, and that they can reconstruct the “entire step sequence” (subsection “Linking synaptic input parameters with output spiking during locomotion”). But it seems that their results are more consistent with a general association between changes in granule cell activity and movement. First, the analysis of the video shows good correlations between movement (motion index) and neuronal activity when large time windows (bins of 1.5 s duration) are used but much poorer correlations when “high” resolution windows of 33 ms, which themselves are actually not particularly precise in terms of motor control, are used. Compare Figure 3B and C but note the different scales of the y axes. Second, Figure 3–figure supplement 1 shows that the increase in neuronal activity begins 100's of milliseconds ahead of the actual movement and decreases to baseline over the course of a second following the cessation of movement. This lack of precise temporal linking of neuronal activity and locomotion is also apparent in Figure 1C-E.
Third, the principle components derived from the video (and used to correlate with neuronal activity) do not seem to be reflecting particularly specific features, at least based on their descriptions. For example, the individual components were said to represent limb, head, and “rest of body” motion. Moreover, the sum of the components representing each of the three categories is 1542, meaning that many of the 1000 components represent more than one category of movement. Fourth, while the analyses shown in Figure 4E, F certainly show that periods of movements predicted by the neuronal activity generally match up with the actual periods of movement, it does not appear that the individual predicted movements align particularly well with the actual movements. Moreover, for most of neuronal signals only a small minority of cells showed a significant predictive quality, and none showed a predictive quality value approaching 100%, which would have implied a matching of the entire step sequence. Furthermore, the predictive quality measure was only used to look at stance-to-swing transitions. One wonders why the swing-to-stance transitions were not similarly analyzed. The authors have addressed most of this reviewer's comments satisfactorily and have improved their manuscript significantly. The topics of this manuscript are very important for the researchers in this field and also of interest for neuroscientists in general. I therefore recommend acceptance of this manuscript for publication in eLife. Although our manuscript has focused on excitation of granule cells during locomotion, we agree that this is an interesting issue. We have obtained a recording of a granule cell at an intermediate holding potential where both IPSCs and EPSCs are detectable. In this recording, which is shown in Author response image 1, the cross-correlation between activity and the motion index is much lower for the IPSCs than EPSCs. This echoes results in other sensory areas showing that tuning of inhibition is broader than for excitation. While this data is interesting and provocative, the extremely low experimental yield for these experiments means the role of inhibition would be better explored in a subsequent project dedicated to this question. We have now included a discussion of the effects of inhibition on granule cells during locomotion, as suggested. The reviewers requested a clarification of the role of spillover versus direct transmission. Our argument is that while spillover and direct (fast) transmission are correlated, spillover transmission provides mainly a slow increase in excitability, whereas the direct transmission provides fine-grained information about the animal’s motion/sensory state. Reviewer 1 is correct that spillover and direct currents interact to generate additional output spikes. However, we demonstrate that what the spillover current is doing is effectively providing an independent means of regulating the synaptic gain. To explore this, we have now provided a new figure, which plots the total synaptic charge as a function of EPSC rate with and without spillover (Figure 2–figure supplement 1). This demonstrates that spillover is a crucial determinant of synaptic gain. Moreover, the model results illustrated in Figures 2 I-J show that this gain control provided by spillover is in a range that is physiologically relevant, i.e. it can have a major impact on spiking output by the granule cell. Reviewer 3 is concerned that despite the high correlations (Figure 2C) between spillover and fast transmission, the modulation of spillover by locomotion (Figure 4B) is lower than for fast transmission. To illustrate what we think is going on, we have made a new supplementary figure (Figure 4–figure supplement 1) in which we show that spillover acts like a smoothing temporal filter. We have taken the bins representing the EPSCs rate in our cells (n = 9), and convolved them with a biexponential kernel with rise time 50 ms and decay time 100 ms (these values were selected to mimic the on-off kinetics of glutamate spillover, see for instance Mitchell and Silver, Nature 2000); please note that the precise values are not important for the qualitative point we are making. Cross-correlating this filtered signal with the original EPSCs signal gives a qualitatively similar cross-correlation as with the actual spillover recorded (compare with Figure 2C), with a high peak value of 0.5. However, if we compare the locomotion modulation index of the filtered signal with the original EPSCs, we see that the filtered signal tracks the animal’s step much less well (Figure 4–figure supplement 1C) – effectively because it is low pass filtering the information at crucial frequencies. In summary, we believe our data provides strong evidence that spillover is important for regulating the excitability of the granule cell to enhance the transmission of information during locomotion. To our knowledge, ours is the first study to show that spillover transmission is engaged in vivo during behaviour in this way. Added a figure on the lateralization of the step cycle modulation (Figure 4–figure supplement 2). Here we show, by drawing an analogy with orientation tuning in the visual system, that granule cell responses can show modulations at different phases of the step cycle, and that comparing the maximal modulation of one limb with the other shows that these peak modulations tend to happen at around 90 degrees. The direction of modulation (up or down) can vary between cells. We have improved our classification of principal components using a semi-automated labelling algorithm, now labelling all 1000 of the principal components. We have provided more details about the classification of principal components in the Methods. We have added a figure showing that the relationship between EPSC rates goes up at locomotion onset, and down on locomotion termination (Figure 3–figure supplement 1). This is an important issue, but it is challenging to reliably distinguish whether the granule cell signals we record are sensory or motor given that the whole-body movement associated with locomotion will engage a range of sensory modalities and motor programs. Given what is known about the origin of mossy fibers projecting to this region of cerebellum, it is likely that sensory and proprioceptive information related to movement at least partially underlies the responses we observe, and we have discussed this in the manuscript. Furthermore, given the sustained increased response rates after locomotion onset (Figure 3–figure supplement 1), we agree with reviewer 1 that there does appear to be a general increase in rate due to movement-related brain states. However, these would not account for the step cycle modulations. In general, we would like to suggest that our paradigm represents an excellent example of sensory-motor integration, in which both sensory and motor information must be combined for optimal performance. Dissection of distinct sensory and motor components will require a substantial additional study (e.g. involving optogenetic tagging and/or silencing of mossy fiber inputs from different origins). In summary, we are confident that we have addressed all of the comments of the editors and reviewers. These changes have substantially strengthened the manuscript. A detailed response to each of the comments of the referees is provided below. The referee has raised a number of important issues. We would like to make several points in response. First, although all granule cells increase their firing rate during locomotion, the relative increases in firing rate span a wide range. The fact that the firing rates of some granule cells only increase very slightly indicates that the granule cells we recorded represent a diverse population with respect to their selectivity for different movement or sensory parameters. Second, please note that Figure 1 shows increases associated with all motion—locomotion as well as grooming, etc. To address this, we have now added a new figure (Figure 3–figure supplement 1) which shows EPSC rates just before and after periods of locomotion. Interestingly, EPSC activity does seem to “ramp up” before the steps start, and be sustained longer than the last step. However to make a precise statement about the timing relation of this activity to total motor activity would require a more sensitive measure such as EMG over several muscle groups, which would necessitate a different experimental approach (and thus should be done in a subsequent study). Third, we do agree that there appears to be a shift in brain state during locomotion (which is hardly surprising given that this type of whole-body movement is likely to engage many sensory modalities and motor programs). However, the short-term modulations in event rates we explore in Figure 3 and 4 cannot be accounted for only by this state shift, since we are correcting for the average event rate (by using normalized cross-correlations and a modulation index in which the mean activity is corrected for). Finally, what this discussion illustrates is that the remarkable sensitivity and temporal resolution of these recordings offer an unprecedented view into how individual elements of the granule cell population parse information about sensory-motor integration, and set the stage for a range of different avenues to be explored in future using this approach. The key result is that there is a massive increase in synaptic input to the granule cell layer during locomotion—equivalent to a state change of the system—which in turn raises the firing rate of the granule cells by an order of magnitude. This level of activity in the network fits the standard definition of ‘dense coding’ (activity density of ∼0.5; see Foldiak & Endres, http://www.scholarpedia.org/article/Sparse_coding). This difference in coding density appears to be primarily related to an increase in the fraction of presynaptic mossy fibers that are active. However, we agree with the referee that a difference in CV cannot be directly translated into a difference in coding density, and have now removed this sentence. This is an interesting issue, but extremely challenging to address directly given the difficulty of these experiments (and in particular experiments designed to record inhibition, which are notoriously challenging). We have obtained a recording of a granule cell at an intermediate holding potential where both IPSCs and EPSCs are detectable. In this recording, which is shown in Author response image 1, the cross-correlation between activity and the motion index is much lower for the IPSCs than EPSCs. This appears to echo results in other sensory areas showing that tuning of inhibition is broader than for excitation (reviewed by Isaacson and Scanziani, Neuron 2011). While this data is interesting and provocative, the extremely low experimental yield for these experiments means the role of inhibition would be better explored in a subsequent project dedicated to this question. We have now included a discussion of the effects of inhibition on granule cells during locomotion, and cited the D’Angelo and De Zeeuw review, as suggested. Simultaneous recording of IPSCs and EPSCs during locomotion. (A) recording of EPSCs (inward currents) and IPSCs (outward currents) concurrently in a granule cell voltage clamped at ∼-30 mV. (B) Cross-correlation with motion index for IPSCs (green) and EPSCs (red), shows a much stronger cross-correlation for EPSCs than IPSCs. Reviewer 1 is correct that spillover and direct currents interact to generate additional output spikes. However, we demonstrate that what the spillover current is doing is effectively providing an independent means of regulating the synaptic gain. To explore this, we have now provided a new figure, which plots the total synaptic charge as a function of EPSC rate with and without spillover (Figure 2–figure supplement 1). This demonstrates that spillover is a crucial determinant of synaptic gain. Moreover, the model results illustrated in Figures 2 I-J show that this gain control provided by spillover is in a range that is physiologically relevant, i.e. it can have a major impact on spiking output by the granule cell. The reviewer is concerned that the ratio of the GC EPSC rate to MFT spike rate is not consistent with the 4:1 convergence of mossy fiber terminals per granule cell. However the reviewer is dividing the mean EPSC rate by the mean spike rate, which is statistically unwarranted (especially for low n). Instead, one needs to calculate confidence intervals for the ratio of the mean event rates. There are several approaches that can be used (see for instance Roy, 1993). For our data, we have employed the bootstrap method. In short, this creates a bootstrap distribution for the ratio by resampling with replacement of the MFT and EPSC event rates. Using this method, we get a 95% confidence interval of 3.49 to 17.67 at rest, and 1.69 to 8.39 during motion. Both of these confidence intervals are consistent with the 4 to 1 convergence. We have performed additional analysis to address this point. 4 out of 7 cells fired in bursts (defined as groupings of 4 or more spikes with ISIs less than 50 ms). These bursts, containing an average of 11.9 ± 2.1 spikes with ISI 10.7 ± 3 ms, occurred with an average inter-burst interval 1.88s ± 0.99 s. These numbers have been added to the manuscript. We mean that there were confluent regions of pixels that correspond to either the mouse's limb, head, body and/or tail. For instance in Figure 3D, the spike triggered average shows a region of high signal which clearly corresponds to the left forelimb. In our principal component analysis, we have now improved our analysis of the principal components to describe all the 1000 principal components in a more objective way. What we mean is that the spiking seems to correlate better with specific features of the motions rather than the total amount of motion (because we get higher correlations with specific principal components than with the motion index). Our new analysis (Figure 4–figure supplement 2), looking at “tuning” to the step cycle corroborates this. To further address this in detail, subsequent studies are needed to correlate a detailed kinematic map of the mouse's motion with the neural activity pattern; unfortunately this is beyond our capabilities at the moment. First, as discussed above, different granule cells show a wide range of increases in firing rate associated with locomotion. 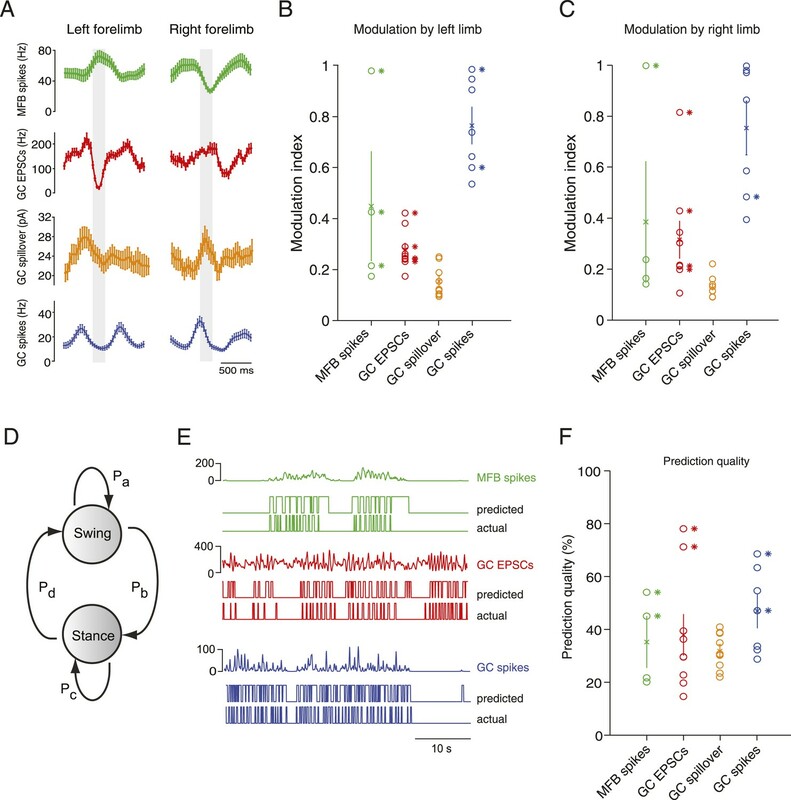 Second, the new Figure 4–figure supplement 2 shows that neurons are tuned to specific phases of the gait cycle and don’t all encode the same thing, so it is not a non-specific increase in activity. Rather, our data provide support for the idea that the representation switches from sparse (i.e. a small fraction of granule cells active) to dense (a large fraction of granule cells active), with the information conveyed by modulations in spike rates, which does not rule out that there may be timing codes embedded in the dense activity (as suggested by the phase-specificity). The durations of the recordings have now been included in the manuscript. The two conditions were always defined in the same way. Quiet periods were defined as periods in which the motion index was changing by a rate of less than 0.025 arbitrary units per frame (with maximum rate of 1 defined from the maximum pixel changes) for at least 30 consecutive frames. Periods of movement were defined as rates of change greater than 0.025 a.u. per frame for at least 30 consecutive frames. These definitions were used to grossly divide the electrophysiological data into periods with and without movement. In some mice voluntary movement was not observed during the recording, but this data was included when calculating overall event frequencies for the different cells types during quiet wakefulness (subsection “Whole-cell recordings from granule cells and mossy fibers during locomotion”). In a subset of cells, activity was recorded during periods of locomotion and quiet wakefulness. In this subset of cells we directly compared the activity recorded during these two conditions. The text has been rewritten to clarify these points. The reviewer is concerned that the ratio of the GC EPSC rate to MFT spike rate is not consistent with the 4:1 convergence of mossy fiber terminals per granule cell. However, this is based on simply dividing the mean EPSC rate by the mean spike rate, which is statistically unwarranted (especially for low n). Instead, one needs to calculate confidence intervals for the ratio of the mean event rates. There are several approaches that can be used (see for instance Roy, 1993). For our data, we have employed the bootstrap method. Briefly, this creates a bootstrap distribution for the ratio by resampling with replacement of the MFT and EPSC event rates. Using this method, we get a 95% confidence interval of 3.49 to 17.67 at rest, and 1.69 to 8.39 during motion. Both of these confidence intervals are consistent with the 4 to 1 convergence. The motion index used for Figures 1 and 2 measures all movements. These are primarily locomotion-related, but can also include movements associated with grooming and other behaviours. Figures 3 and 4, and the new supplementary figures, look specifically at locomotion. We have revised the text to clarify this. Our background subtraction algorithm is a variant on common background subtraction techniques (e.g. see M. Piccardi, Background subtraction techniques: a review. Systems, man and cybernetics, 2004 IEEE international conference, Vol. 4. IEEE, 2004). We have changed the wording of the Methods section to be clearer about which of the values are vectors or scalars. With our alpha of 0.3, this means that the background is averaging over about 15 frames, which is about 500 ms. The method calculates an iterative weighted average of the current frame with the previous background, so that past frames contribute to the current background estimate with decaying weights. 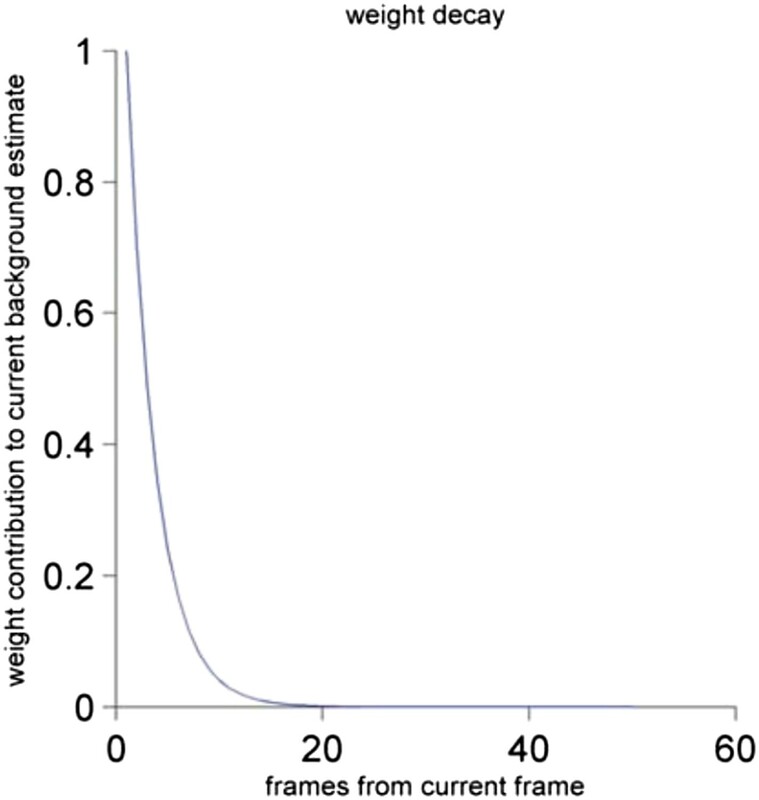 We have graphed this weight decay function below (see Author response image 2). The contribution of the frame to the current background estimate as a function of the distance of the past frame to the current frame. See Materials and methods for a detailed description. In Figure 1 in the manuscript, we show the motion index normalized to the peak value in the whole session for simplicity. However, we stress that the actual units of the motion index are irrelevant for the correlational analyses, because we use normalized cross-correlations. We agree that on their own these numbers would make a weak basis for the conclusion. However, in conjunction with the fact the EPSCs go in the same direction (since the EPSCs originate from the mossy fibers), we remain confident that this is a robust finding. We apologize for this typo and have fixed the text and legend. The P-value is indeed across the bursts, not cells. We have also made the text more precise: out of the 7 cells, 4 had bursts, adding up to 37 bursts in total. 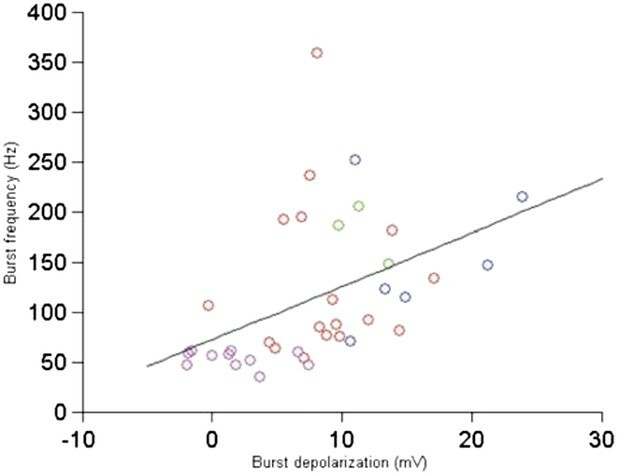 The figure below relates the burst depolarization with the burst frequency—there is a good correlation (Author response image 3). There are too few bursts per cell to comment on whether this population trend is also visible at the single cell level. Relationship between burst depolarization and burst frequency. Each colour represents a different cell from which the burst was recorded. The event detection algorithm (together with careful manual inspection of all the data) allows detection of events with very small inter-event intervals (∼0.2 ms). This allows even summating EPSCs to be counted as individual events. We have addressed this concern by substituting our manual labelling of the principal components with a more objective semi-automated method. This has allowed us to label all the principal components rather than a few. The method is described in detail in the paper, but briefly we defined regions of interest (ROIs) in the videos corresponding to the body parts and measured the pixel changes in these ROIs for all the principal components, and decided based on a threshold what body parts were involved in the principal component. Note that the proportions reported are in keeping with our initial manual labelling. Our video recordings don't allow accurate tracking of the forelimb trajectories. However we think it will be very fruitful for further studies to build a proper 3D kinematic model of the limbs during locomotion, and use this to correlate limb velocities and joint angles with patch-clamp recordings of activity. This will require a major effort which is well beyond the scope of the present Short Report format. 2) In Figure 2, glutamate spillover currents significantly contributed to the spike outputs of GCs, and subthreshold depolarization strongly correlated with the frequency of burst firing of GCs during movements (Figure 2H). However in Figure 3 and 4, peak correlation between the motion index and the spillover was fairly low. The authors explain that this is due to slow time course of spillover currents (subsection headed “Linking synaptic input parameters with output spiking during locomotion”). However, the strong correlation between spillover currents and GC spike outputs indicates that the time course of change in CG spike rate is similar to that of spillover currents (Figure 2G, left). Therefore the correlation between spillover currents and the motion index is expected to be similar to that of GC spikes. This is an interesting point, i.e., despite the high correlations (Figure 2C) between spillover and fast transmission, the modulation of spillover by locomotion (Figure 4B) is lower than for fast transmission. To illustrate what we think is going on, we have made a new supplementary figure (Figure 4–figure supplement 1) in which we show that spillover acts like a smoothing temporal filter. We have taken the bins representing the EPSCs rate in our cells (n = 9), and convolved them with a biexponential kernel with rise time 50 ms and decay time 100 ms (these values were selected to mimic the on-off kinetics of glutamate spillover, see for instance Mitchell and Silver, Nature 2000); please note that the precise values are not important for the qualitative point we are making. Cross-correlating this filtered signal with the original EPSCs signal gives a qualitatively similar cross-correlation as with the actual spillover recorded (compare with Figure 2C), with a high peak value of 0.5. However, if we compare the locomotion modulation index of the filtered signal with the original EPSCs, we see that the filtered signal tracks the animal’s step much less well (Figure 4–figure supplement 1), effectively because it is low pass filtering the information at crucial frequencies. To address this issue we have added a figure on the lateralization of the step cycle modulation (Figure 4–figure supplement 2). Here we show, by drawing an analogy with orientation tuning in the visual system, that granule cell responses can show modulations at different phases of the step cycle, and that comparing the maximal modulation of one limb with the other shows that these peak modulations tend to happen at around 90 degrees. The direction of modulation (up or down) can vary between cells. We have modified the text to be more conservative in our claims. We understand the reviewer’s concern, but we have shown all the recorded bursts in Figure 2H, and also described the burst statistics in the text. The purpose of Figures 1I-1K is to show movement-related event rate increases. We appreciate the positive feedback and have done our best to tone down the claims that the reviewer finds to be questionable. We have changed the text to be more accurate. The reviewer is concerned that we have not sufficiently addressed the possibility that our results are just due to an increase in activity during motion. The strongest argument we have against this is the step cycle-related rate modulations: If the rate merely correlated with the amount of motion, then we wouldn’t see down-modulations of rate during the swing phase of one limb as we observe in some of our cells (Figure 4–figure supplement 2D). The reviewer correctly points out that Figure 3B and 3C show that at coarse time scales, the correlation coefficients are high, while the cross-correlation coefficients at fine time scales are smaller. First of all, these two graphs are measuring slightly different things (note there was a mistake in the axis label of Figure 3C which we have corrected): for coarse time scales we are measuring the raw correlations, whereas for the short time scales we are measuring the peak in the normalized mean-subtracted cross-correlation. The mean subtraction implies we have measured modulation in event rate versus modulation in motion index, so by definition these cannot merely be due to average motion. However, we stress that we agree with the reviewer’s main point: there is a general increase in the event rates which is non-specifically related to motion, and there is a smaller modulation of rates which transmits information on top of that. Indeed we would argue that this is the main finding of our paper. To the reviewer’s third point, it is correct that we have components with several parts of the body represented (this is best illustrated by the examples in Figure 3E which shows regions of activity for the ears and limbs), but what we would argue is that these components often show coherent movement of related body parts (e.g. forelimb motion followed by hindlimb motion representing locomotion at a certain speed). However we agreed with the comments in the previous revision that manual labelling of these components is fraught with subjectivity, which is why we settled on a—less informative—automatic labelling method. We think that the case for relative specificity of the neural activity for a given mode of motion is most strongly emphasized by the comparison with the gray curves generated with surrogate data in Figure 3F: this demonstrates that there are clearly a few components which correlate far above chance with neural activity. Since these cross-correlation are again generated by mean subtraction, they cannot be due to a non-specific increase in rates with the general amount of motion. However, we have toned down the references to tuning to address the reviewer’s concerns. Finally, we picked stance-to-swing transitions since these sequences of movement can most accurately be resolved in time from our videos. Furthermore, our metric (which requires precise timing and good recall/precision) and our algorithm (which is unsupervised) are quite conservative and it would be very surprising to be able to get close to 100% precision with single cell events. Given that granule cells are known to code for many different sensory modalities, it is surprising—or at the very least non-trivial—to be able to read out discrete motor events in the way we have shown. It is quite likely that if we optimized a supervised learning method to read out the step sequence, we would be able to improve the prediction score, but we feel this is beside the point we are trying to make, namely that the step sequence is represented in the granule cell layer, which is an entirely novel finding. Probably the most principled way to estimate just how much of this information is encoded would be to calculate the mutual information or transfer entropy between the step sequence and the neural activity, but these methods would require very long recording times to converge. Nevertheless we have modified the text to be more conservative in our claims about step prediction in a way we hope will satisfy the reviewer and editor. We are grateful to Tiago Branco, Arnd Roth, Christoph Schmidt-Hieber, Charlotte Arlt, and Beverley Clark for helpful discussions and for comments on the manuscript. We thank Arifa Naeem for technical assistance. This work was supported by grants from the Wellcome Trust, ERC, and Gatsby Charitable Foundation. Animal experimentation: This study was performed in strict accordance with UK Home Office regulations. Experiments were carried out under Project Licence 70/7833 issued by the Home Office, which was issued following local ethical review, and under the relevant Personal Licences issued by the Home Office. All surgery was performed under isoflurane anesthesia, and every effort was made to minimize suffering. © 2015, Powell et al.